CMA CGM has revealed that revenue and volumes climbed through the second quarter of the year, despite operating in a market that continues to be affected by rising fuel costs. The France-based shipping group saw volumes transported through the quarter rise 9.6 per cent, higher than industry growth, while revenue increased 7.4 per cent, up to US$5.7bn. 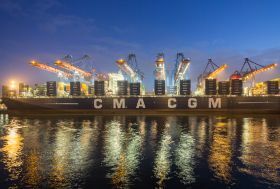 "Over the second quarter CMA CGM has recorded a core EBIT margin close to the first quarter as well as a positive net income in spite of a sharp increase in fuel prices," explained Rodolphe Saadé, chairman and CEO of CMA CGM. "The strong volume growth demonstrates our commercial strength and the quality of our service offering. "The acquisition of a 25 per cent stake in CEVA is an important step in our strategy to complement our transport offering with logistics services.